Travel Photography—Bridges and Stairs. 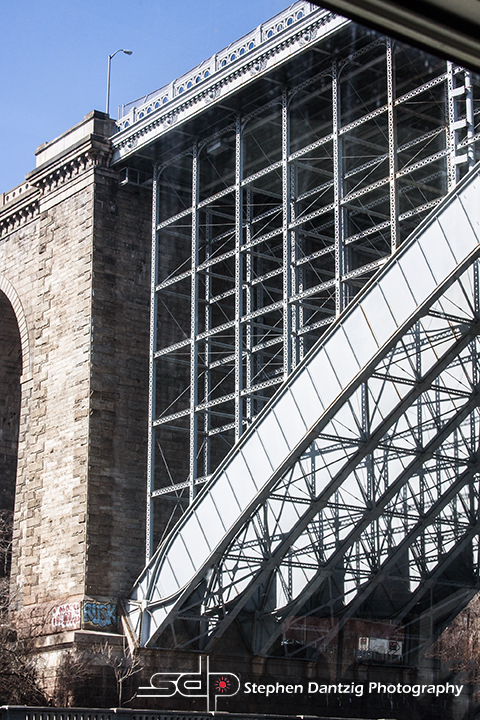 Bridges and stairs might seem like an odd choice for a blog discussion, but I love them! Bridges and stairs can be an iconic part of your location, provide intricate design elements to capture, create a sense of mystery in your scene and, well, create a humorous dynamic that begs to be explained! You still need to make some decisions about how to best capture the image. One of these decisions involves the focal length of your lens. Joan and I took the Circle Line Cruise around Manhattan (fantastic event—-please put this on your “MUST DO” list for any visit to NYC) on a very cold March day. I do not plan on getting into a debate over the pros and cons of a zoom lens versus prime lenses, but the zoom worked great on this tour. The cruise passes under many of the over TWO THOUSAND bridges in and around New York City (yes, you read that correctly…2,000!). I believe that this one is the Hell Gate Bridge, a railroad bridge built in early 1900’s connecting Queens to Randall’s/Ward Island. The design and the lines of the architecture are what caught my eye and this “‘detail” shot was more interesting to me than the overall image. This image was more about the design of the bridge and therefore required a “closer” look. Camera: Canon 50D. Exposure f10, 1/1320th of a second, ISO 400. 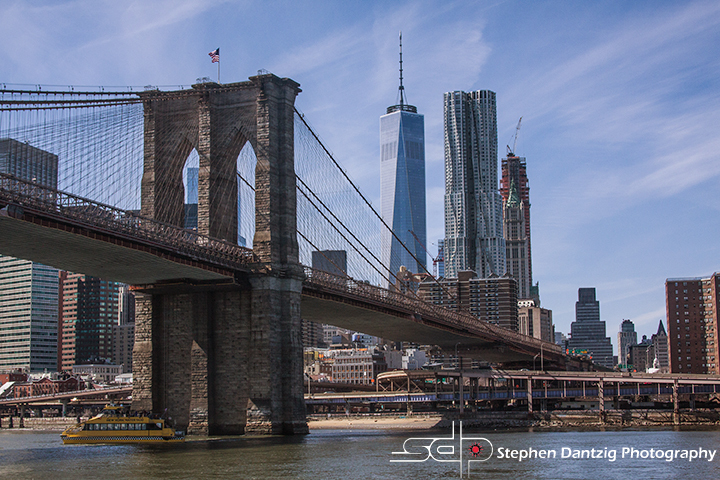 In contrast, while this image of the iconic Brooklyn Bridge and the “new” downtown New York City skyline is by no means a “wide angle” shot, but it is wide enough to set the scene. I am not sure if it the formidable bridge in the foreground or the Liberty Tower symbolizing New York’s “rebirth,” but this is one of my favorite images that I have created of my “home town.” Long live New York City. Camera: Canon 50D. Exposure f10, 1/1000th of a second, ISO 400. The Brooklyn Bridge certainly presents a very different feeling than this bridge is on the very quiet and serene Wailua River on the Island of Kaua’i, Hawai’i. 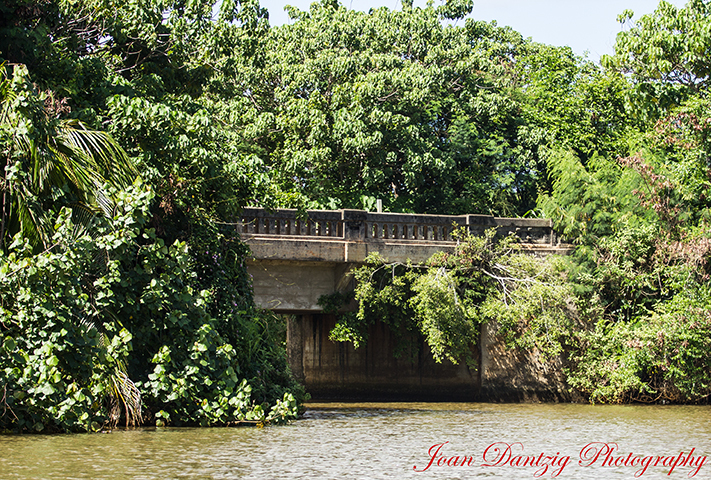 Joan captured this peaceful scene on a boat cruise up the river in 2014. We would experience the river in a very different way a couple of years later on a kayak! However, I love the sense of anticipation and intrigue that Joan created with her composition. I think the image would have been boring and mundane if she waited for “THE” shot of the boat passing the center of the bridge! Camera: Canon T2i. Exposure f4, 1/600th of a second, ISO 200. Bridges often create a sense of the unknown for me and I love being able to capture that feeling. I think that one of the many things that can make a photograph interesting is to create a little tension, or a question, in your image. Photographs of bridges without an obvious destination work well to entice your viewers. 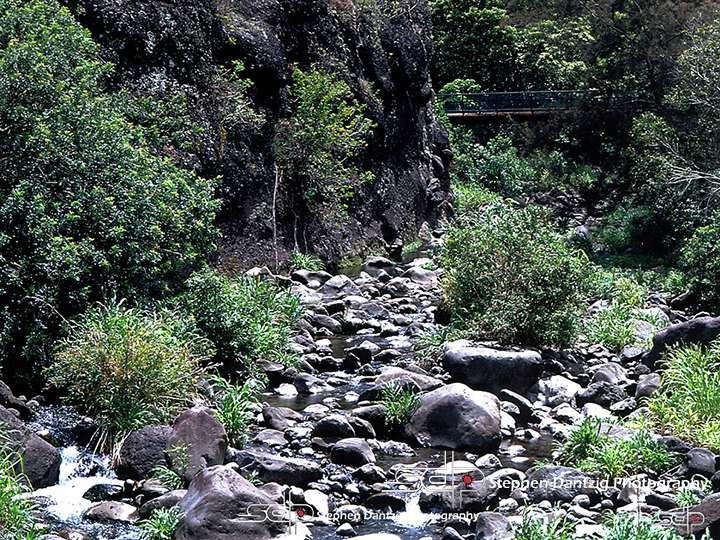 I created this image of Iao Valley on the Island of Mau’i during what I thought would be my first and last visit to Hawai’i. Little did I know that Hawai’i would soon become my home Let’s face it: this image is pretty, but boring…except for the upper right hand corner! What is that bridge doing there and where does it lead? I will sadly never know because I learned a few years later that it was a several hour hike to find out. Camera; Bronica SQA, Probably Kodak Ektachrome slide film ASA 100, exposure not recorded. A good composition is the key to keeping your viewers engaged with your photography. Joan took a really good photography and improved it by cropping out some dead grass and moving the bridge slightly of center. I love how the bridge leads you off into the unknown. 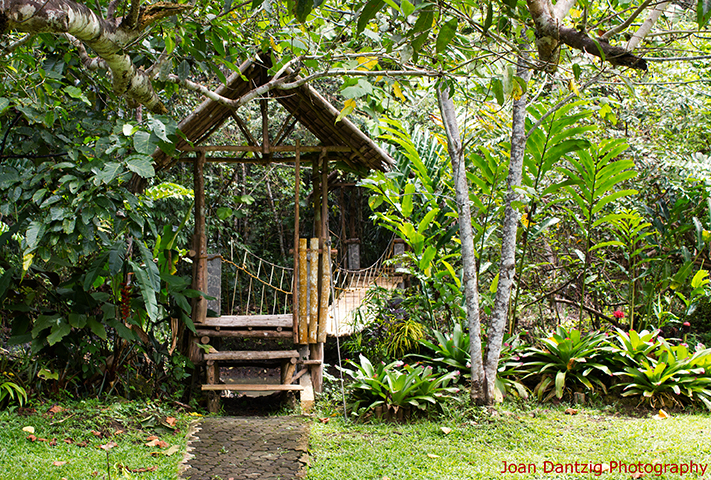 This quaint little bridge is at a tarsier preservation farm in Bohol, Philippines. What is a tarsier? Good question. 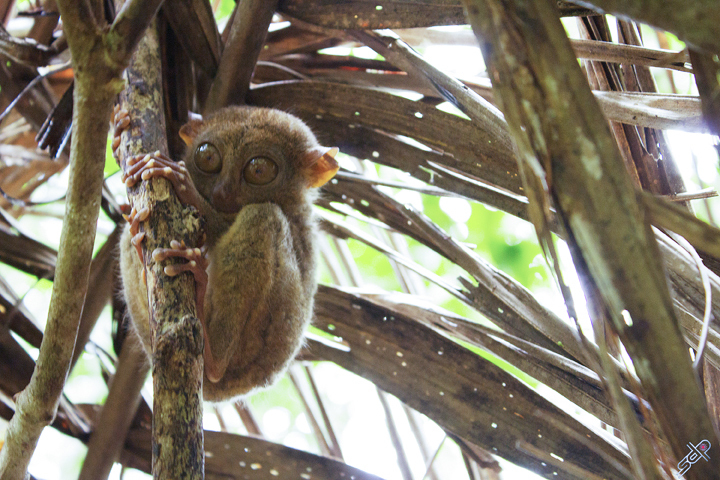 Tarsiers are tiny primates found almost exclusively in Southeast Asia. These big-eyed creatures could fit in the palm of your hand! Camera: Canon T2i. Exposure f8, 1/200th of a second, ISO 800, Canon T2i, Exposure f5.6, 1/60th of a second, ISO 1600. Stairs can also make a dull scene fascinating—yes, stairs. The first shot is one of my favorites, and sadly, I didn’t create it—Joan did! 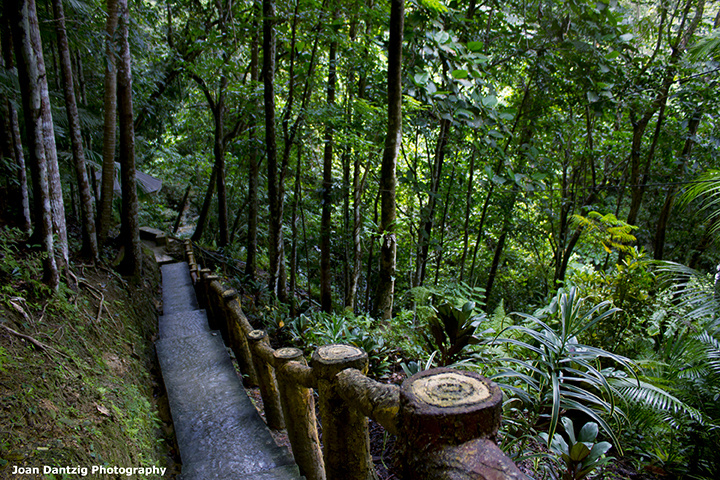 This is the long (about 80 stairs) and damp (so I opted not to go) staircase that leads to Mag Aso Falls in Bohol, Philippines. Joan did an incredible job with her composition, avoiding the “usual” center placement of the steps. 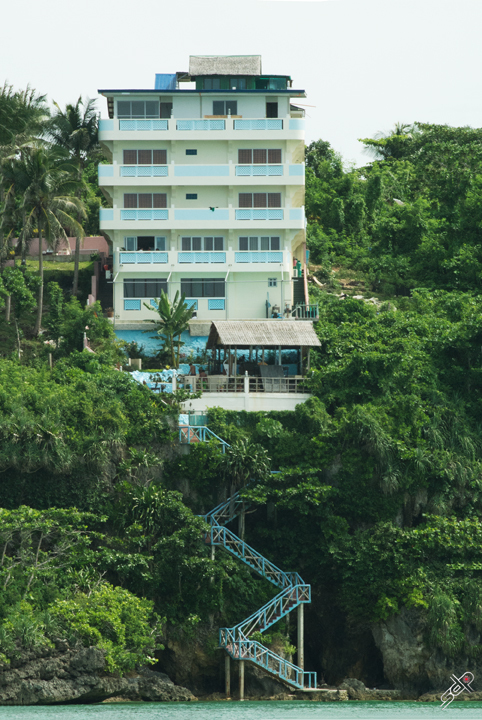 The jungle to the right adds important components as it sets the scene and the left turn of at the bend of the staircase (in view) adds a sense of mystery to the image. These magnificent waterfalls were what greeted Joan at the end of her Journey down the stairs! I wish I had made the trek down! 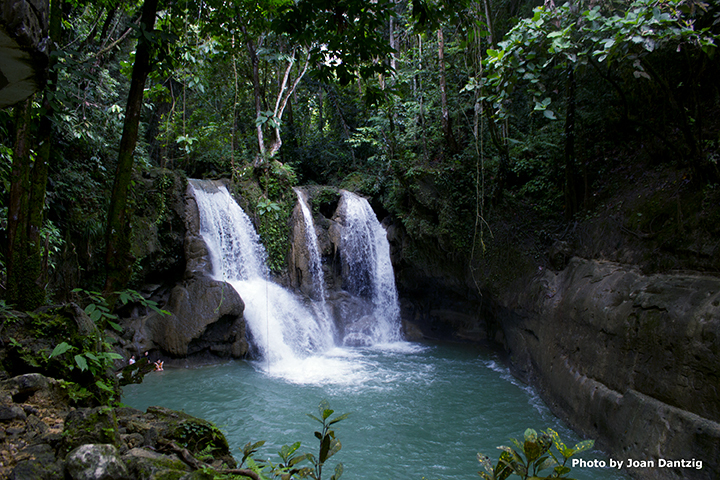 The beautiful waterfall seen here is what was waiting for Joan. Camera: Canon T2i. Exposure f3.5, 1/1250th of a second, ISO 400, Canon T2i, Exposure f3.5, 1/1250th of a second, ISO 400.